Amanita muscaria - Fly Agaric. 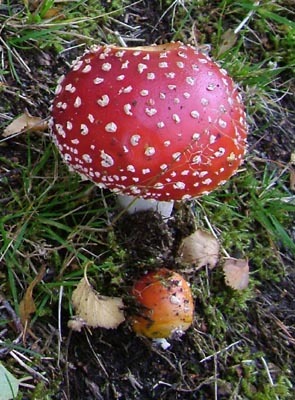 The Fly Agaric is the archetypal fairy toadstool. The red hemispherical cap dotted with white can be seen in paintings and illustrations everywhere. Its name derives from traditional use as a fly stupifier. Fragments of mushroom were left in bowls of milk and unconscious flies could then easily be disposed of. 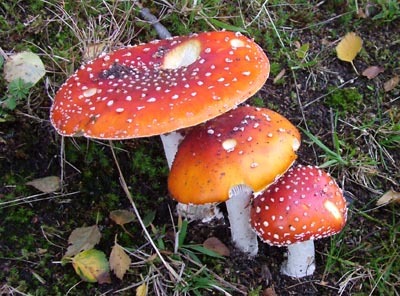 Amanita muscaria has also long been known for its narcotic effects. Some people also suffer from gastro-intestinal problems if the mushroom is consumed. Amanita muscaria first appears as a small orange/red sphere. The colour develops into a bright scarlet with or without the white specks. Older specimens have a generally paler appearance, probably due to the pigment being spread over a larger surface area. Some specimens have no spots or are partially spotted. The spots are remnants of the immature fungal cap and can be removed either by rainwater or by mechanical means, for example being repeatedly rubbed by a blade of grass.